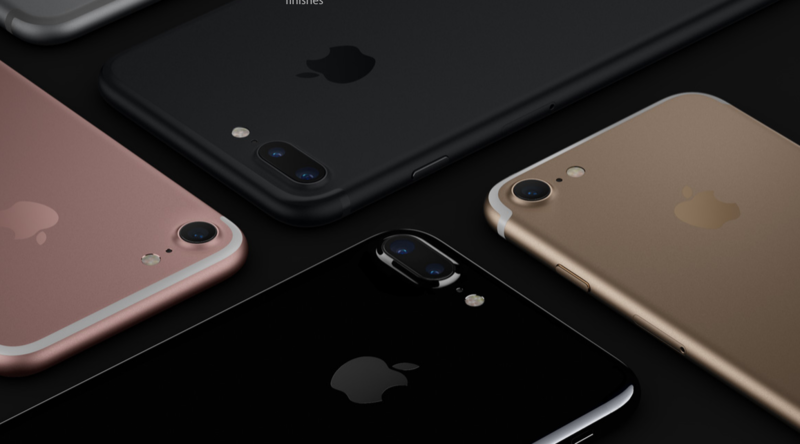 Today Apple announced it’s two newest iPhones, the iPhone 7 and iPhone 7 Plus, at a press conference in San Francisco. While they both look a lot like the iPhone 6 and 6s, they’re equipped with several special upgrades, including a water-resistant design, a brand-new glossy black finish, and better cameras for shooting in low light. They also come with iOS 10, Apple’s latest version of its mobile operating system, which comes with big changes to the Messages app and voice assistant Siri. Yep, the rumors were true. Apple ditched the traditional headphone jack that’s been on every smartphone since the beginning of smartphones in favor of delivering tunes through the phone’s Lighting port (which is also used to charge the phone). To listen, you’ll use Apple’s new wired EarPods, which are included with the iPhone 7 and 7 Plus. Apple also introduced AirPods, new tiny wireless headphones with a built-in microphone. You’ll also be able to listen to audio with your own Bluetooth headphones or with an adapter, included with the iPhone, that works with traditional headphones. Despite all of the options to convert your existing headphones for the new iPhones, Engadget reports that it will be a “painful transition for many” to make the switch. The iPhone 7 has a 12-megapixel camera with optical image stabilization, which CNET calls a big deal. However, the star is the iPhone 7 Plus, which sports two camera lenses, a first for Apple, that can create special effects like zoom and wide-angle shots. Recent iPhone models have been able to take a few splashes without suffering a terrible fate, but they’ve never been deemed waterproof. This year, the iPhone 7 and 7 Plus get a water-resistant stamp of approval from Apple. They’re both IP67 rated, so they can take a splash or dunk, but won’t hold up for extended swims. The home button gets a makeover, with force-sensitive technology, which is “like the Force Touch trackpads used in recent MacBook laptops,” according to the Verge. Apple’s created brand-new finishes and colors for the iPhone. There’s a new glossy aluminum black color, called Jet Black. And a matte black that’s simply called Black, which replaces the earlier Space Gray color. Both join Gold, Rose Gold, and Silver color choices. Because Apple got rid of the headphone jack, it was able to devout more space to speakers on the bottom edge. The new stereo speakers will be “twice as loud as the 6S and 6S Plus while also providing increased dynamic range,” says Ars Technica. Both new iPhones have an Apple A10 processor, which make the phones run, according to Apple, significantly faster and more efficiently than previous iPhones. Ready for a new iPhone? Speck just launched a new line of cases designed exclusively for the iPhone 7 and 7 Plus, called Presidio. These new cases are slimmer and more protective than any case Speck’s made before. The iPhone 7 and 7 Plus are available for pre-order September 9, and Presidio cases for the new phones are available now on Speck’s website. Along with the iPhone 7, Apple also announced a brand-new Apple Watch, called Series 2. It’s water-resistant, or as Apple calls it, swimproof. It’s designed with water sports, like swimming or surfing, in mind and is resistant to up to 50 meters. A redesigned speaker actually ejects water when you get out of the pool. It has new internal guts that make it faster, with a dual-core processor and new graphics processor. Its second-generation display is brighter, making it easier to read. It also has built-in GPS that you don’t even need a data signal to use. Beyond that, the physical design hasn’t changed much, as The Verge points out. Apple Watch Series 2 comes in aluminum, stainless steel and new a ceramic finish. It’s available for preorder on September 9th. Stay tuned for news from Speck on the new Apple Watch.